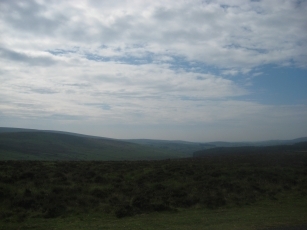 I continued to enjoy the fantastic scenery of Dartmoor as I left this morning. There were plenty of sheep laying in the road and Dartmoor ponies crossing randomly. A few miles away from my destination today I stopped for a few minutes, then noticed that a car behind me had stopped in the middle of the road. It turned out that they’d broken down. So, after leaving my bike off of the road and donning a bright yellow jacket I went and helped to push them off of the road. It wouldn’t move and it turned out that a build up of a pressure in the brake hydraulics was forcing the brake on. A friend of the driver resolved that and we pushed the vehicle off to a safe place. I then stopped for lunch in the village ahead. It was quite obvious that I was going to arrive very early at tonight’s overnight stop (the same place in Silverton that I stayed at on the way down towards Land’s End). I noticed from my OS map that there is apparently a cycle route (regional cycle route 52) nearby (denoted by the green dots along some of the roads), so decided to divert off and investigate it. It’s there, but very thinly signed. Some junctions can only be inferred from the presence of signs a bit further along. I’ve followed it for a few miles; I’ve no idea whether we’ve got any coverage of the cycle route in OSM yet. Certainly the roads showed up in the coverage on my GPS, but I’m not currently using the cycle map variant of the GPS map. Despite the distraction of following the cycle route I still arrived quite early, so sat around in what is effectively the village square for a bit. The next few days should take longer again as the distance is markedly up again now that I’m heading away from some of the hills. I should also cover some as-yet unmapped portions of the National Cycle Network (that is unless someone has mapped it since I left Canterbury a couple of weeks ago). One bit should prove interesting as it appears to be located on some mudflats, possibly making it only accessible at low tide. I’ve no idea of the tides for tomorrow, but I do have a backup plan in case the route does prove inaccessible. This entry was posted on Tuesday, June 30th, 2009 at 19:04 and is filed under Cycling. You can follow any responses to this entry through the RSS 2.0 feed. You can leave a response, or trackback from your own site.